Credit card debt can become a problem more quickly than many people imagine, even if they think that they are not being extravagant in their credit card spending habits, which is often the case, it is the interest charged on balances that is the real problem. There are a lot of ways that various experts suggest to manage credit card debt and before you pay money to a debt settlement service or consider something as drastic as bankruptcy they are well worth trying. Here is a little about some of the solutions that do work for many people trying to pay down credit card debt. Made popular by a financial writer a few years ago the Snowball Solution to credit card debt challenges the notion held by many that you should pay off high interest credit cards befog low interest credit cards and tackle the largest debts before the smallest. Here is a brief overview of how it works. Fred has several credit cards on which he currently has balances of various sizes. In this example he has five credit cards. One has a balance of $100, one has a balance of $500, two have balances of $800 and the last one is a real problem because he is carrying a balance of $4,000 on it. The first step is to stop using the cards, as accruing new debt will mean that this method simply will not work. Fred does not cancel his credit cards as that will damage his credit rating but makes a resolution to only use his debit card instead. Then he gathers his bills and works out what the minimum payment on each credit card is each month and pays those minimums on all but one of the cards, the one with the lowest balance. On that one he pays as much as he can afford, trying to make sure he actually pays at least double the minimum every month. By doing this he will probably pay off that first card in just a few months. Then, that payment can be applied to next credit card in the chain, in addition to continuing to make the minimum payment he was already making. The idea is that the payment process “snowballs” until all but that big debt is paid off. With all of that money that was being paid towards the other credit card debts now available to be put towards the bigger debt only that too should be paid off in 24 months at the most. This credit card debt management system can work very well, but it takes a lot of discipline. The motivating factor can be though that once all the debt is paid off all of that money will now be available for other purposes, even a nice vacation as a reward for all your hard work. There is a different school of thought though that says that rather than taking the small balances first you should begin tackling your credit card debt by dealing with the highest APR balances first and working your way down to the lowest. In an ideal situation you would be able to transfer at least some of the debt off a high APR credit card to the lower APR cards but if you are at or close to your limit on that lower APR card that will not be an option. Some people also secure yet another credit card – one of those that offers a 0% APR rate for a certain number of months – as a way to “freeze” the interest being charged on their biggest debts until they can pay it down. In theory that is a good idea but there are two potential problems. One is that if all the debt is not paid off within the interest free period you may be facing a high APR again (very few low APR cards offer these 0% deals) and the second is that you are adding a brand new untouched credit card to your wallet and unless you put it away right away the temptation to use it might be just too great. If you cannot transfer your high interest balances the idea is once again to make minimum monthly payments on all your credit cards, but then putting the extra money towards the highest APR balance, however big or small it is. Paying these debts off first will save you money in interest charged so this method of reducing credit card debt makes a lot of sense as well. 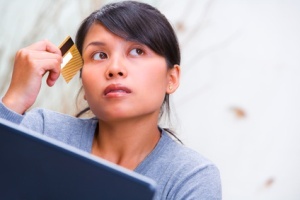 There are some methods of managing credit card debt that are not such a good idea in most cases. For example dipping into your 401K for the money to pay off your credit card debts may seem like a great solution but there are a great many penalties (and tax headaches) attached to doing so and you will of course also be dipping into the money that should be saved for your retirement. And you do also have to “pay yourself back’ if you take out a loan against your 401K, which means incurring yet another debt. Whether or not you should consider refinancing your home to pay off credit card debt is a rather controversial subject. If you are not behind on your mortgage and can secure a good deal with terms that are equal to, or even better than your current mortgage and you have a large amount of credit card debt then a cash out refinance as it is known may be worth it. However no credit card company can take your home away if you do not pay your bills while a mortgage lender can certainly take your home if you fail to pay that loan so you may be putting your home, your biggest asset, at risk to satisfy unsecured debt, perhaps not the best idea.